In December 2016, Clowns Without Borders France continued to help its partner HsHs Clowns and gave workshops to 30 Egyptian artists. They also created a show and performed it twice. 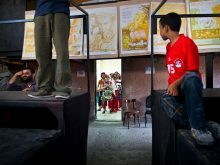 In April 2016, Clowns Without Borders France did some reinforcement of artistic capacities workshops in Egypt, and created a French-Egyptian show. They also did a 4-day intervention in hospitals. 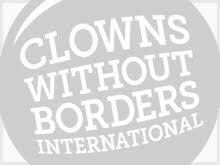 In April 2015, Clowns Without Borders France evaluated their partnership with the collective Red Tomato in Egypt. In June 2014, Clowns Without Borders France continued its joint project with the collective Red Tomato in Egypt. A show was created and performed 12 times for more than 2 500 refugee children from Syria. In 2013, Clowns Without Borders France went to Egypt and performed 19 shows for 4500 people. 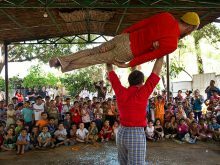 In 2010, Clowns Without Borders USA went to Egypt, and partnered with local artists and with Plan International to perform 18 shows and give workshops 2800 people. In 2010, Clowns Without Borders France went to Egypt with the support of the International Social Samu, and performed 21 shows for 6000 people. In 2010, Clowns Without Borders France went to Egypt thanks to the Air France and the Anna Lindh foundation. They performed 7 shows, and gave workshops for 2500 people.